I am interested in the beach comer house for 4, 5 acre lots I have in Cochise county AZ. 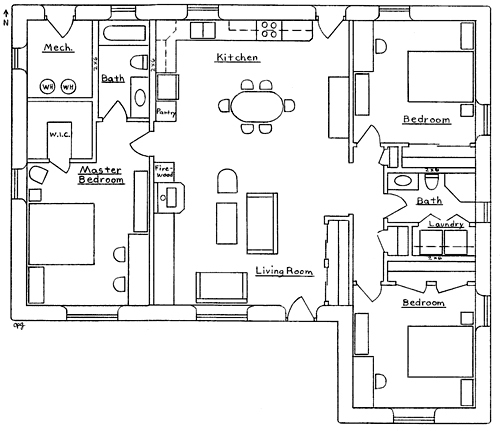 Are there any homes with this floor plan that have been completed in US, that have actually gone through any planning department. I would would be very interested and even pay to speak with someone who has completed this process. The plan has sold before, but I do not keep up with everyone who orders plans. Most people are private and do not want publicity. Very few people publish their projects online. But be assured Structure1.com can get the plans code approved. 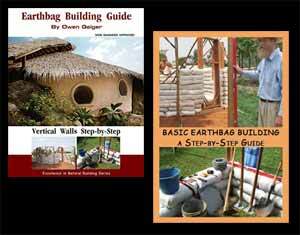 hi if I build the house using the earth bags, can I use bags to construct the walls between the rooms. What i mean the walls will end up 40 cm in depth…does your design accommodate for that? That’s not recommended because it wastes a lot of space, time, labor and materials. The only way it would make sense is in earthquake zones: a simple design with one shear bracing way down the center. If you want to do this anyway, buy my AutoCAD plans and modify them to meet your requirements. Standard interior walls are wood framed for ease of construction, running plumbing and electric, etc. If you don’t have to meet codes then there are lots of options such as using recycled wood, pallets, bamboo, straw-clay, CEBs, etc. Owen, do you offer on site assist. I would be interested in utilizing your knowledge. I plan to do a earthbag build in July 15′, feeling a little unsure of the possibility of doing a square, no framing (other than window & doors) using bags right together. but have some negative feedback on this being a good idea. I live in northern californiat. weather is 4 seasoned. Very few extremeties of bad weather in my history. Could you let me know if you do consulting on site and what the costs would be if possible. Thanks so much, look forward to hearing from you. Yes, you’ll need a permit. The plans will meet code if you work with Structure1.com. They can get my plans code approved. They can make minor modifications like you mention. Cost varies according to where you live. Due to all the codes in California, it will be expensive. I might have some spare time in 6 months after our homestead is finished. Drop me an email around that time if you’re still interested. Another question. Have you trained any Thai in this construction method? I think it would be best if I could hire one to direct the local work force in this endeavor. Perhaps it would also benefit the locals in new construction methods. If you could recommend a possible Thai man to hire, I would appreciate that. We are in the Sisaket province. Yes, but workers can find work very easily here and so there’s no incentive to leave home and work elsewhere. Don’t worry. Workers learn quickly. You don’t need skilled earthbag builders. It’s 95% shoveling and carrying buckets and tamping. I am interested in this design. However, I would like to know, more about the section views and how they relate to materials. Is it possible to get an entire material take off excluding plumbing and electrical? Each house plan includes one basic section view of the wall construction. Materials lists are not included. This helps keep the plans affordable. Plus, most people will end up adapting the basic idea and utilize local materials that vary from place to place. Email me before you come. Where do I buy the bags? Earthbag Building.com then click on Resources. Or search on the Internet for a supplier near you. Shipping is a major expense.